When Dark Souls makes adults weep into their hands, it’s usually because of the game’s brutal difficulty. But reddit user TartarusRex0707_ recently lost his best friend, and shared a touching story of their bonding over Dark Souls. The friends were separated by distance, and used games as a way to keep in touch. Drunk Souls, in which people drink themselves silly while trying to survive a Souls game, became one of their favorite pastimes. Though they dabbled in the original Dark Souls, it was Dark Souls 2 where things really clicked. The two would play together, with TartarusRex0707_ taking the lead and his friend watching, learning, and helping out. 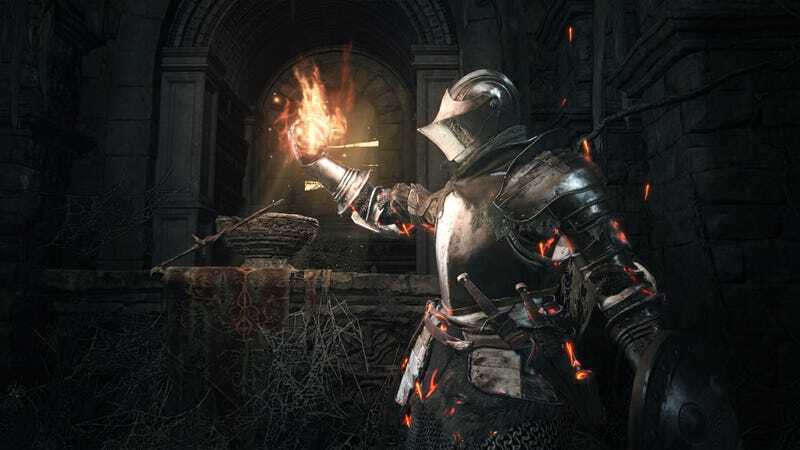 When Dark Souls became backwards compatible on Xbox One, they were determined to play as much as possible before Dark Souls 3 came out. Playing with friends is an underrated part of Dark Souls. “Finally after a year of build up, I got to share my favorite game with you,” said TartarusRex0707_. Making progress in Dark Souls became tough, as his friend would stop playing early in the night, claiming he was tired. This wasn’t a surprise; his chronic health issues were well-known. When he was younger, it was routine for him to be in the hospital, but the result was always positive. He always beat the odds. “I didn’t think much of it,” said TartarusRex0707_. But when the friend revealed he was fighting a blood clot in his lung, he got concerned. It sounded serious, but like usual, his friend played it off. Though he’d be in bed earlier and earlier, the two survived Anor Londo. They even beat O&S, one of the game’s most difficult but memorable fights. There were plans to see each other soon, but his friend asked if he could push up that date. “Of course,” he said. Though the two were best friends, they weren’t always close. Life took them in different directions at times, and TartarusRex0707_ always felt guilty for not staying in touch. His friend never held it against him, and they always picked up where they left off, as though no time had passed. TartarusRex0707_’s regrets not hugging his friend when he said goodbye. The two had a date to stay up late for the launch of Dark Souls 3, so they could experience the latest game together. His friend was tired, but he managed to stay up long enough for the game to download and get patched. His friend was in pain, and though he’d seen a doctor, it apparently didn’t matter. He encouraged him to keep playing, but TartarusRex0707_ refused, wanting his friend to feel better, so they could do it as a pair. When TartarusRex0707_ texted him the next day, hoping for good news, there was no response. As it turns out, he’d passed away in the hospital overnight. He was 26 years old. One player suggested he should make his friend as a character in the game. As it turns out, that’s already his plan. “We will beat the game together, whether this existence wills it or not,” he said.